CYTSB antibody LS-C141197 is a DY488-conjugated rabbit polyclonal antibody to human CYTSB (SPECC1). Validated for IHC and WB. SPECC1 / CYTSB antibody was raised against an internal synthetic peptide made to the human NSP5a3a protein sequence (between residues 1-100) Percent identity by BLAST analysis: Mouse, Rat (83%). 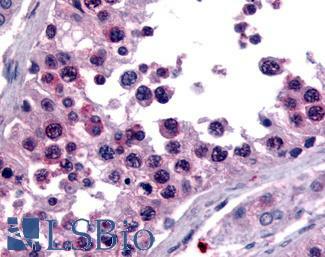 Anti-SPECC1 / CYTSB antibody IHC of human testis. Immunohistochemistry of formalin-fixed, paraffin-embedded tissue after heat-induced antigen retrieval. Antibody concentration 20 ug/ml. This image was taken for the unconjugated form of this product. Other forms have not been tested. Detection of NSP5a3a in HeLa whole cell lysate (RIPA). 0.5 ug/ml dilution, 15 second ECL detection. This image was taken for the unconjugated form of this product. Other forms have not been tested.